I play a DW kit using a double tom stand. I've been considering buying a tom mount for two reasons 1) to reduce my footprint on stage, and 2) reduce the size/weight of the hardware I lug around. I'm interested in other people's comments on the pro's and con's of doing this. There are the obvious cons of drilling holes in a currenlty virgin kick, perhaps reducing the value of the kit overall etc. but there are probably a number of things I have not considered. The kit itself is black velvet wrap. Adding hardware (Tom Mounts) to the bass drum will reduce the resonance of the drum, as far as how much, or how noticeable a change it will be, your guess is as good as or better than mine. That was the main reason drum companies got away from Drum mounted toms on their higher end drums. The reduced resonance may not be enough to outweigh the other benifits you mentioned, of being lighter, less floorspace, etc. I advise against doing anything to a shell cause you can't reverse a mistake. having not only a tom mount, holes and bolts, and then two toms (and whatever other knick-knacks up there will hinder the bass drum sound. You may want to consider a rack, or rack bar, instead of tapping the shell. There are racks that have cymbal posts in the verticle bars. There are rack bars that would attach to your existing cymbal/tom stands. Having weight on the side of the bass shell could change the sound, increase the risk of the shell warping, or it may be the perfect cure for your problem. In my previous kits I never liked having shell mounted toms because I could never get a good adjustment for bass drum and toms... You drastically limit your felxibility in tom/bass drum placement. There probably exists some form of a bass drum tom mount that doesn't penetrate the shell... by using the lugs or the tuning rods... but I would rather have that drum resonate freely. Just get a bracket that'll mount on a cymbal stand and put a tom mount on it...reduces one stand...just adds weight to another. The only drawback to DWs is that unless you custom order a kit with a floor tom and tom mounts on the kick drum (which isn't recommended, since they have to drill more holes into the drums!) you will have to invest in some new hardware to hold your toms. I tried the DW clamp-on tom mounts (example: DW double mount, Pacific also makes similar mounts for cheaper, I believe) and while those worked great, there's too much stress on your older cymbal stands. I got a lot of movement from mine, which while they never fell over, they moved a bit too much for my liking. I then went with the rack you see above (got a great deal at a local shop here in Columbus) and Gibraltar tom mounts. The Gibraltar mounts didn't have the complete 360-degree range that the DW ones do, but mounted on a rack you don't need it. If you're going all-out, DW does make some great stands (both cymbal/tom stands and just double-tom stands--example 1, example 2) that most music stores will try to get you to buy anyway, and they have a plethora of dog bone attachments that--if you're willing to pony up the dough--will allow you to set up pretty much anything in anyway imagineable. I went with the rack because I, too, wanted to decrease my on-stage footprint. I never tried the DW stands (I think if you're going that route, this might be your best bet) because I didn't want to shell out the cash to replace perfectly good Pearl stuff that I already had--hence originally going with the clamp on mounts. I've played out with the set up as you see in my photos a few times since I got it all finalized in late January, and it's been pretty awesome. Nothing moves (not even the toms), and it's actually faster to set up and tear down than all of my old stands, thanks to the rack's memory locks. I hope all of this helps in some way, shape, or form! 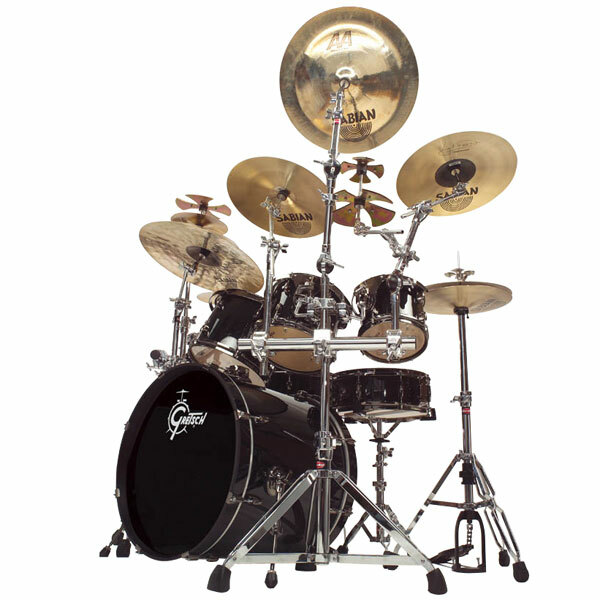 When I first bought my dw set, I purchased and mounted all the toms and cymbals on a gibraltar rack. It seemed ideal to be able to mount everything where ever I wanted. But as I got more time behind the set, I found there were times when I would've liked to just have the set in a very basic configuration and that was almost a chore with the rack. Just last year(geezzz, I think it was last year... hmm... time sure does fly when yer havin' fun), I finally bought 3 double tom mounts with boom cymbal arms on them. I have from left to right... my hats, a double tom stand with my 10" tom on the inside arm and a dogbone with a cymbal on the left arm and a cymbal boom swung toward center. The bass drum comes next(never had a tom mount, nor do I ever want to put one on it), then a double tom stand with the 12" tom mounted on the inside arm, a boom arm swung toward center with a crash on it, a dogbone on the outside tom arm and another crash mounted with a fixed hat auxiliary arm mounted off the tom head tube. Then, another double tom stand with my 14" and 16" toms mounted and a ride cymbal on a boom arm mounted to that. I know it sounds complex, but it really isn't and it wasn't that hard to get it set up. But the nicest thing about it is that it doesn't take long for me to strip it down to a very simple 4 piece kit with hats, ride and two crashes. And thats perfect to haul to a quick set up gig where ever the need arises. Anyways, just another option of what to do. But the basic answer to your question is, I prefer to not have anything mounted to my bass drum except the May mic mount holding that Beta52 mic inside of it. On the left side, I'm thinking a gibraltar double tom stand, with an 8x7" tom and a 19" crash mounted off it on a boom. On the right hand side, here's the interesting part. I'm trying to mount 2 toms and 3 cymbals off one (sturdy) stand. It's probably a bad idea, but set-up and onstage footprint wise it just can't be beat. An image of how it's supposedly done is available here. My setup's a little different as the 10x9 needs to be at the height of the 8x7 tom, and the 12x9 needs to be lower, in line with the floor tom. I guess I'll need to clamp the 12x9 off the stand itself, separately and lower. I'm also trying to mount a 21" ride (not much higher than the toms), a 17" crash and a 19" china on either side of the ride using the hybrid (cross bar) mount shown in the image and those single + double articulated boom arms. Am I crazy? Do you folks think it'll work? I Can't Believe These Guys Are Worried About The Bass Drum Resonance. They Buy A Bass Drum With No Tom Mounts So It Resonates More, Then They Put A Pillow In It To Reduce The Resonance !!!. I Defy Anyone To Tell The Difference In Sound On A Bass Drum With And Then Without Toms. I Can Guarantee That Any Slight Difference In Sound Will Disappear Once It Gets Past The Stage And Into The Audience. My Brother And I Both Have Drumsets We Got Back In The 60's With Bass Mounted Toms. They Both Sound Great. And If You're Worried About The Weight Of The Toms Warping The Shell Of The Kick, Just Take Them Off When You Are Not Playing. One Of The First Rules Of Playing In A Band........keep It Simple ! Good reply!!! I totally agree with you. Have all the sound "manupilating" contraptions added, like cushions, tape, moongel, mufflers, holes in reso-skins, have the cymbals under 60 degrees from the horizontal etc.etc. One of the good things about bass-drum mounted toms is their fixed relationship (in space) to the kick pedal, thus to your seating position! When the toms are placed to your liking you will always have them e x a c t l y where you want them!! or b: Are back to the "old" simple ways. Even Simon Phillips(TOTO) who has a Sh*t load of gear is (in a way) critical about racking and does not always use racks. But hey, we all have our idiosyncracies, which keeps it interesting, really! !